"I turned to HalloweenLasers, the industry laser leaders, to help me create a fantastic disorienting special laser effect for my haunt. Their easy to install Babette Laser Effects System turned a dull, dense fog filled hallway into a WOW!... a Disorienting Laser Fog Pathway." "Thanks so much for the fantastic laser system. It was so easy to operate right out of the box. Everyone working on the Forest of Fear has been just boggled by the effect. The photos we have taken of the effect have gotten incredible feedback, in fact several people refused to believe we shot them on set, they thought they were digital effects for our marketing materials! We have started brainstorming and experimenting with various effects for next year... lots of possibilities! We ordered the Babette with a specific location and effect in mind, but it has proven so versatile, that we have a half dozen other sites it would be perfect for - for a host of different effects. 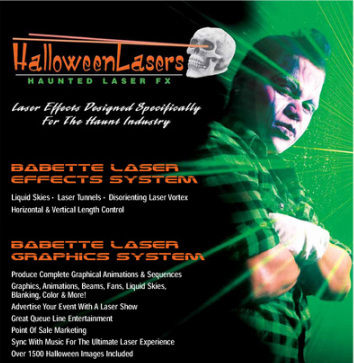 I would absolutely recommend the Babette laser system to any Haunt looking to up its production value instantly." "It was really easy to use. I just plugged it in, connected the few cables, and then decided the width and height of my laser tunnel down our 40' hallway. The four actors and myself that were in the room while it was turned on, all said that we liked it." "It's a great unit for the price and definitely easy to use.."